My first report for The Diffusion Group came out last week and readers of this blog (or, more accurately, their companies) can get $500 off by mentioning this blog when you email jay@tdgresearch.com -- you can see details here. According to a new report from TDG, revenue from OTT TV advertising - that is, commercial advertising placed in full-length TV-quality programming delivered via broadband - is expected to grow nearly four fold between 2015 and 2020. The Future of OTT TV Advertising 2015-2020 represents the first publicly-available ad forecasts associated exclusively with the delivery of OTT TV content. According to TDG's analysis, the average ad load for a 30-minute legacy linear program will decline by 38% between 2014 and 2020, from approximately eight minutes to around five minutes. During the same period, average OTT TV ad loads will increase 63%, from 3.2 minutes to 5.2 minutes, during the same time period, bringing OTT TV ad loads in line with that of legacy linear TV. This shift in ad load is not all bad for content networks. 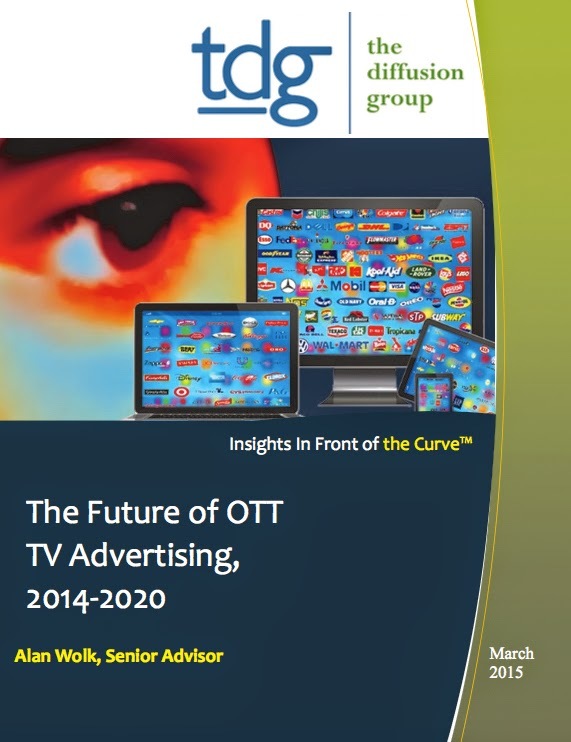 According to Alan Wolk, TDG senior analyst and author of the new report, the value of legacy linear TV advertising in 2020 will be worth considerably more than today. Wolk adds that new forms of advertising such as native and sponsored promotions will generate additional revenue and keep total TV ad revenue stable through 2020 (no growth in total revenue, but no decline, even as dollars are shifted to OTT TV ). By 2020, OTT TV ad revenue will be approximately $40 billion, just under half of 2020's projected $85 billion in total TV ad revenue. These are just a few of the unique insights featured in TDG's latest analysis and forecast of the burgeoning OTT TV space. The report includes an in-depth examination of the trends driving (and inhibiting) the shift from legacy to OTT TV advertising, as well as detailed forecasts for total TV ad revenue, weekly OTT TV viewing, and both OTT and legacy linear TV ad revenue.